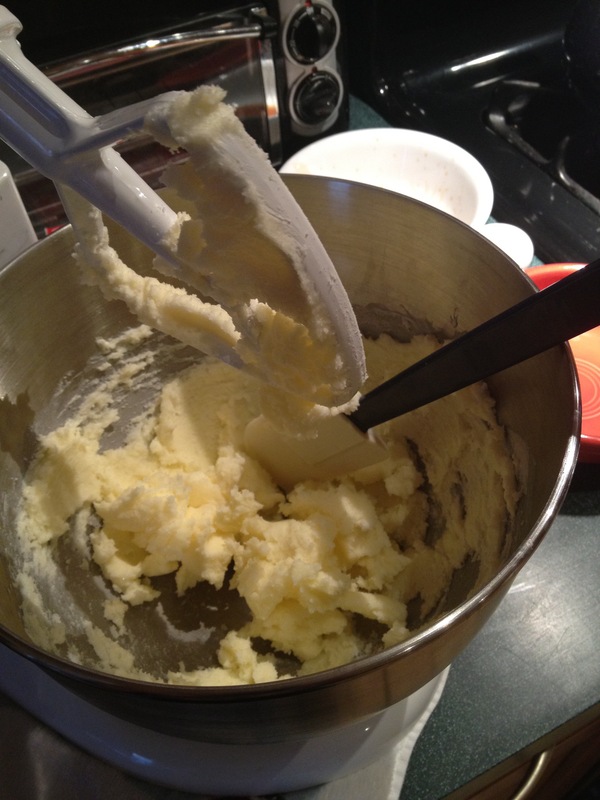 The foundation for many a delicious cookie: creamed butter & sugar. I get really excited and obsessive about my holiday baking. I freely admit it. I started baking mass amounts of cookies and giving them as gifts when I lived in Los Angeles—this was five years ago, when I was just getting my career off the ground, nearly broke and in need of economical yet impressive Christmas gifts. Ta-daa: cookies. I was very by-the-book then—I got creative in how I drizzled chocolate on a peanut butter cookie, but I followed the recipe from Williams Sonoma to the letter (and as I recall it was a damn good one). That first baking-Christmas, I made several batches of three types of cookies: a classic that I knew how to make in my sleep (chocolate chip), a fool-proof crowd favorite (oatmeal), and a cookie that I had never baked (the aforementioned peanut butter cookies). I added the chocolate, because chocolate and peanut butter have had the most loving and successful marriage in history, so why keep them apart? I’ve maintained my tradition of holiday cookie baking since, and each year, as I add more cookies to the roster I turn my kitchen into a 24-hour bakery in the weeks leading up to Christmas. Generally these marathon baking sessions are only interrupted by trips to the grocery store to restock supplies (I never seem to have enough butter or flour, and just yesterday I ran out of sugar. That’s a first!). Once the baking is done, I consult my list of people I’ve baked for, and start the assembly of trays (for co-workers and families) and individual goodie bags (for friends, and as on-hand gifts when I’m surprised by the receipt of an unexpected present). My kitchen table becomes a mess of wax paper, plastic wrap, tissue and ribbon. The whole process start-to-finish is positively exhausting, and I love every minute of it. This year, I have a lot more people to bake for than in years past: clients, new friends, my boyfriend’s family, in addition to my father, his neighbors, my mother, her neighbors, and a whole lot of my friends. And my boyfriend, my biggest fan and Chief Tester of Confections. Of course, I always save some for myself, but I know I’ll be getting a wide and wonderful array of delicious, artful and traditional cookies from the woman who inspired all this baking in the first place—my mom. My Holiday 2011 baking plan is also more ambitious than in years past, and there will be a lot of firsts: Gingerbread cookies, cut and decorated sugar cookies, and Shortbread cookies to name a few. I will be baking two new kinds of biscotti, a riff on Monster Cookies (still a maybe), and Snickerdoodles. I’ve been experimenting with flavoring butter cookies with coconut and lime, and I’m currently working on giving a grown-up makeover to a chocolate cookie recipe I’ve always liked but felt needed a little more oomph. Does anyone have any good tips on rolling and cutting refrigerated dough, particularly gingerbread? Do you bake around the holidays? Are there certain cookies, cakes, et cetera you only make around this time of year? This entry was posted in Musings, Sweet Tooth and tagged baking, butter, chocolate, christmas, gingerbread, holiday cookies, peanut butter, sugar, tradition. Bookmark the permalink. Love this—especially the fig leaves!